I’ve eaten at the Jinky’s in Sherman Oaks a couple of times. The first time was a suggestion from a friend, and after that my husband and I were sold. I love that you can order breakfast anytime. I love that their menu is huge. The only thing I don’t like is the size of the parking lot, but that’s L.A. for you. This past Sunday, my husband and I met a couple friends for lunch at Jinky’s. We arrived around 12:30, and there was a half-hour wait. The parking lot was full, so we found street parking not too far away in the residential neighborhood. Talking and catching up with friends passed the time quickly. There is indoor and outdoor seating. It was a slightly warm day (upper 70s), but the outdoor seating was in the shade. We were seated inside, and the air conditioning was a little high but not so cold that I needed the sweater I brought with me just in case. Our waiter came over to our table probably about 3 times before we were ready to order. The only problem with the menu is that there are so many options, and they all sound delicious. Glancing around at the plates being served to other diners doesn’t help. Perhaps it even complicates the matter. Do I want eggs or pancakes? Do I want eggs and pancakes? Wait; do I want a burger instead? I was torn between the VooDoo Omelet and the Pumpkin and Baked Apple Crepes. I’ve had both before, and both are delicious. In the end, I chose the Pumpkin and Baked Apple Crepes because I’m pretty good at making omelets at home, but (at least as of yet) I can’t make crepes. The Pumpkin and Baked Apple Crepes were as good as I remembered. 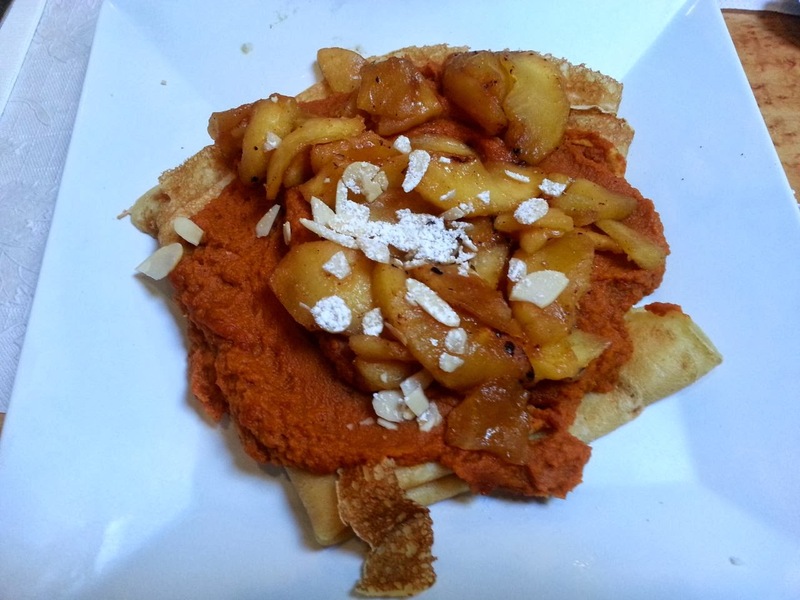 They’re described on the menu as “Topped with pumpkin marmalade, baked cinnamon apples, whipped cream, and almonds; dusted with powdered sugar.” Considering pumpkin pie and apple pie are my two favorite types of pie, this is definitely my favorite type of crepe. The pumpkin marmalade thickly covers the crepes below. The baked apples are perfectly tender and delicious. I couldn’t ask for anything more. Just now, when I looked at the photo I took of my meal, I realized that they didn't put whipped cream on my crepes. Obviously, I didn't miss it. My husband was the only one among us who decided to order lunch. He barely even glanced at the multiple pages of breakfast offerings. He went straight to the burgers. I can’t blame a guy for knowing what he wants. He ordered the Peppercorn Gorgonzola Burger. All sandwiches come with fries or a salad. Trying to be somewhat healthy (choice of burger aside), he went with the salad. The burger was a pretty good size. 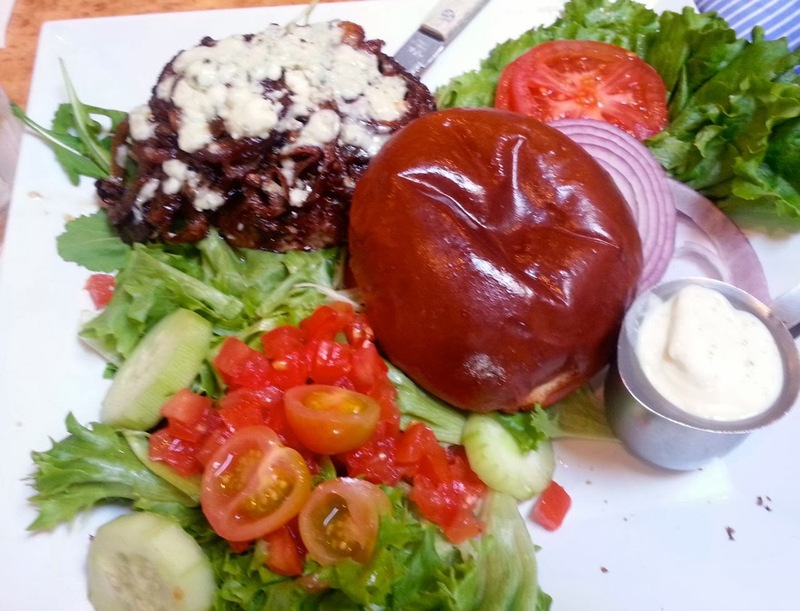 It was topped with grilled onion, arugula and gorgonzola cheese. I tasted a bite of it, and it was a good, juicy burger. The bun was nicely toasted too. Our friends (a married couple) couldn’t decide between omelettes and pancakes, so they decided to share. One ordered Whole Wheat Pancakes, and the other ordered the Rosemary Omelette. That way they could each taste both. I couldn’t convince my husband to order the VooDoo Omelette so that I could have the best of both worlds, but once I tasted my crepes, I really had no regrets. Honestly, I’d probably order the same thing next time. 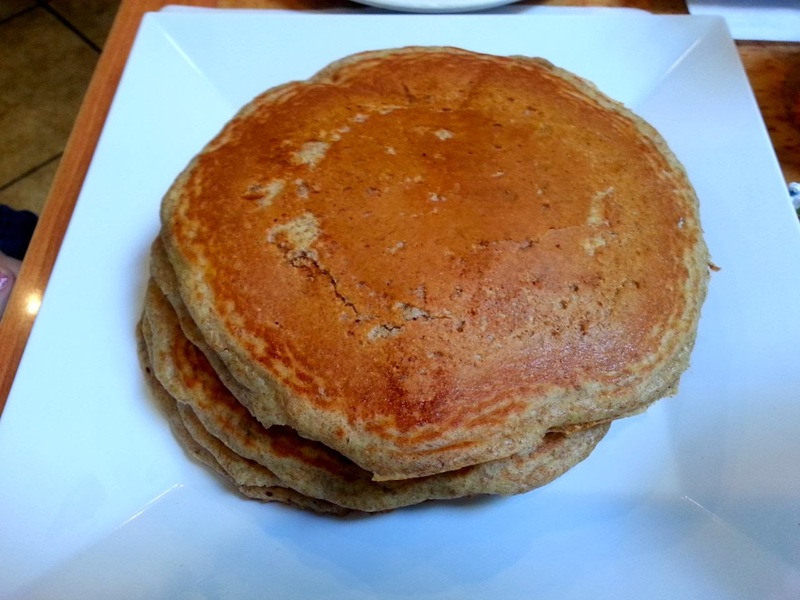 The Whole Wheat Pancakes came in a stack of 3. They were large and super fluffy. Our friend drowned them in maple syrup. The waiter asked if she wanted sugar free syrup, but she chose to soak them in the full sugar version. I tasted a bite, and they were fluffy and delicious. They had a nice whole wheat flavor. I don’t think I’d be able to handle a whole plate of those pancakes though. It’d be too much of the same. 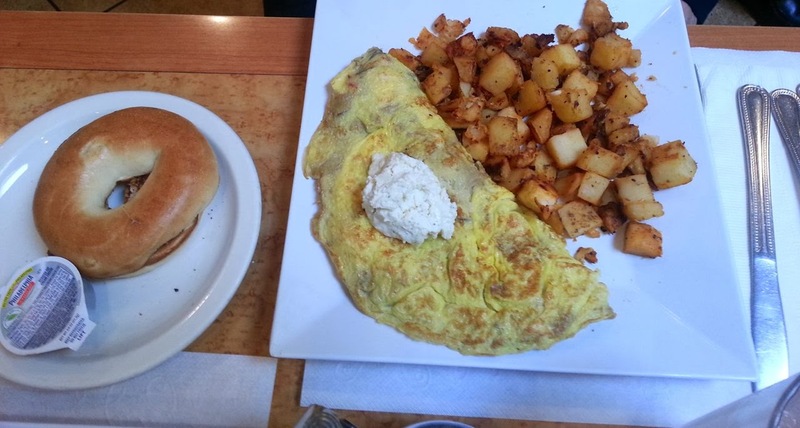 The Rosemary Omelette is described on the menu as “chicken, artichokes, sun-dried tomatoes, rosemary, and Boursin cheese.” All omelettes come with your choice of potatoes, cottage cheese tomatoes or tater tots plus your choice of toast, tortillas, bagel or English muffin. Our friend chose the potatoes and a plain bagel, which came toasted. I didn’t taste this meal, but it looked delicious, and our friend wiped the plate clean. I don’t think there was even so much as a piece of potato left behind. Well, he did only manage to finish half of the bagel, but I still consider that a good effort. It certainly looked delicious, and I heard no complaints. In short, I look forward to my next visit to Jinky’s. I really need to go there more often so that I can try more items on their menu. The prices are reasonable, especially considering the large servings. The waiters are friendly, and even though the restaurant was crowded, we never felt rushed. If you’re looking for a great place to have a meal with friends, or if you want to eat breakfast in the afternoon, you have to check out Jinky’s. There are multiple locations around L.A., so there’s bound to be one near you.